The Florida DMV Online Practice Test lets you immediately review over 100 multiple choice questions and answers directly from the Florida DMV’s entire database of motorcycle questions, covering every chapter of the manual including rules of the road, traffic signals, laws, signs and safety. Like other states, Florida requires that you have an automobile driver’s license to get your motorcycle license, however, the test grills you on the specifics of driving and operating a motorcycle in Florida so it’s different than the questions you took in the driver’s exam. DMVCheatSheets.com offers a variety of options to help you easily prepare for and pass the Florida Motorcycle Written Test. 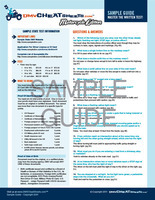 The Florida DMV Motorcycle Cheat Sheet is a downloadable, immediately accessible 3-4 page reference guide featuring the top 50 questions and answers to help you easily pass your Florida motorcycle driving written test. Florida DMV Motorcycle Cheat Sheet & Online Practice Test Bundle is the most complete and easiest way to prepare for your DMV motorcycle written test. You get our downloadable, printable 3-4 page cheat sheet to take with you to review as well as our online practice test system, featuring 100 multiple choice questions and answers similar to those you will come up against when taking the Florida DMV motorcycle exam. Our study material cover every chapter of the FL DMV motorcycle manual including rules of the road, traffic signals, laws, signs and safety.